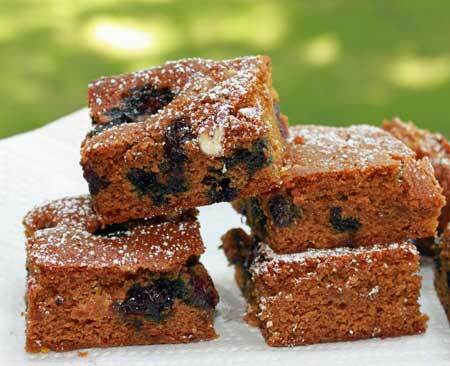 Blueberry Gingerbread Bars are great with a cup of coffee or hot tea. Preheat oven to 350ºF. Line an 8 inch pan with non-stick foil. Mix together the flour, baking soda, baking powder, salt, cinnamon and ginger. Set aside. Whisk the oil, molasses and brown sugar together in a mixing bowl. Whisk in the egg and lemon zest. With a large spoon or spatula scraper, stir in the flour mixture. Batter will be pretty thick, so add the blueberries and do it gently, taking care that you don’t mash them up too much! Spread batter in pan and bake for about 22-25 minutes or until the kitchen smells gingery and the bars appear set and brown around the edges. Let cool completely in the pan. Lift from pan and cut into 16 squares. Dust with powdered sugar if you like.